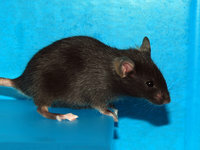 The kf-1 gene was first discovered as a cDNA clone whose mRNA synthesis is elevated in the cerebral cortex of Alzheimer’s disease patient (1), and identified later in the rat cerebral cortex after repeated electroconvulsive treatment and chronic antidepressant treatment with SSRI (2). The KF-1 protein is one of the Zinc finger proteins belonging to the RING H2 family, which have been assessed for their ability to facilitate E2-dependent ubiquitination (3). Cells that express exogenous kf-1 result in apoptotic cell death in vitro (unpublished data). 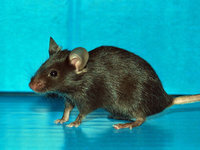 Kf-1 deficient mice, called “hicky” mice (“hicky” means hikikomori symptome in Japanese slung, which resembles to “social withdrawal” in English. ), display typical anxiety-like behaviors without any other major abnormalities including pathological, physical, behavioral and reproductive aspects. References : (1) Yasojima K et al., Cloning of human and mouse cDNAs encoding novel zinc finger proteins expressed in cerebellum and hippocampus. (2) Yamada M et al., Identification of a novel gene with RING-H2 finger motif induced after chronic antidepressant treatment in rat brain. (3) Lorick KL et al., RING fingers mediate ubiquitin-conjugating enzyme (E2)-dependent ubiquitination.